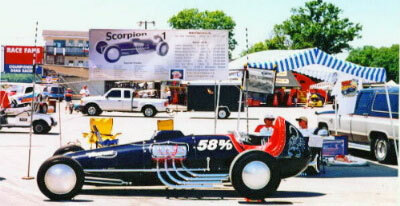 The Scorpion 1 was built by Bobby Langley of Everman, TX. 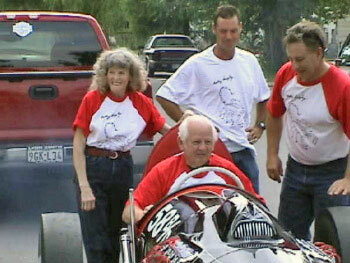 He and his wife Ruth still live in the same house where the first car was built beginning in 1955. Bobby was a tool and die maker at Convair aircraft (General Dynamics). He would work on the car in the mornings and go to work for the second shift. At times he was allowed to build some small parts at work. The first incarnation was called Needle Nose. 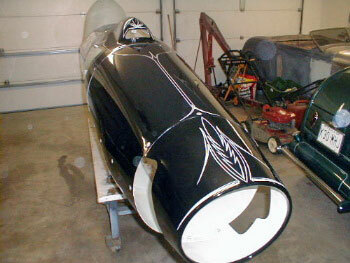 It had a body made from a jet wing tip fuel tank. The pointed rear end of the tank was turned to the front of the car. 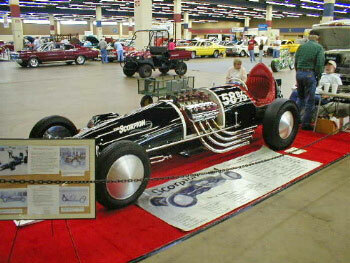 Needle nose ran a Cadillac V-8 engine with four two barrel carburetors. The needle nose was a participant at Kansas City in 1956. 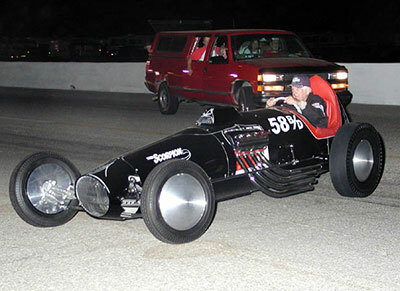 It briefly had a flat head Ford V-8 then it got a new body and a 354 Chrysler was installed. 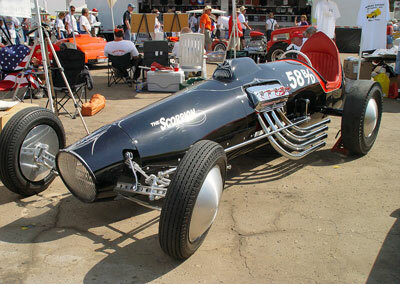 The newly re-bodied Scorpion 1. An Everman policeman nicknamed it Scorpion and it stuck. As seen here it had a 1957, 392 Chrysler from a local dealership. 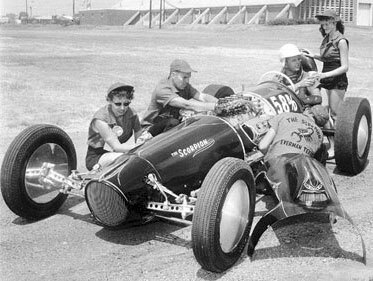 Bobby Langley and "crew" with his Scorpion I at the 1957 Oklahoma City Nationals. Car won best appearing car and crew. 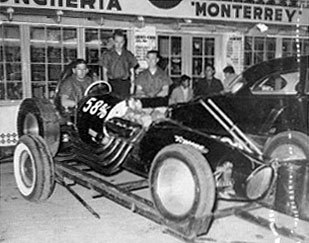 Here the car is shown in Monterey Mexico In 1958, seated is Bobby Langley, standing on trailer ramp is Bobby Walcott, and next is his current Partner Bill Collins. They towed the Scorpion with the 51 Olds coupe with the swoopy side pipes. Below Bill tells the short story in his own words. 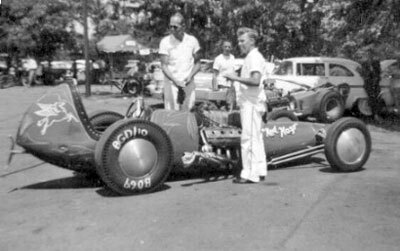 The 1958 trip to drag race in Monterey, Mexico By Bill Collins Somehow Bobby Langley or I got notice of a drag race in Monterey, Mexico in January 1958. A club in San Antonio and one in Monterey sponsored the race. We put the ole short pencil to the expense of the trip and decided to "do it". What with the expensive price of gasoline at $.22 cents a gallon ($.19 cents in Mexico), we decided we could make the 800 mile trip (one way), eat, get a motel, etc. Bobby got off work Thursday night from Convair in Fort Worth at about 11:00 P.M. Bobby Walcott and I were at Bobby's house when he got home, Loaded up with the clothes (blue jeans and Isky T shirts) trailer, Scorpion 1, tools, nitro, Etc. and set out going south in the middle of the night. 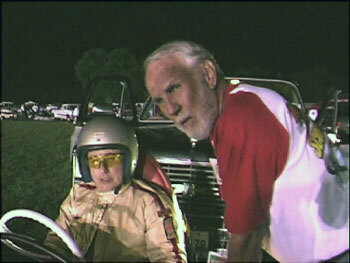 We had little money (you understand), Bobby had no personal car and I had no racecar at the time. 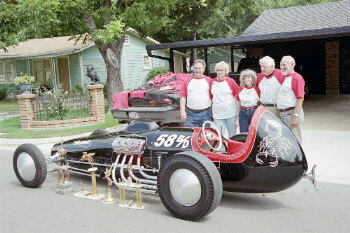 Here we go all the race stuff, no spare parts and very little money all hooked up behind my 1951 Olds with Walcott's flames adorning the front fenders and four chrome blooie pipes running up the rear on each side. What a site, like a circus with no animals. Just three idiots and a doll out to conquer the drag race world. We were just in our early 20's. After 21 we found we did not know everything as we previously thought. We got to the Mexican border in the middle of the next night. "Papers please" from the border guard, What are papers we asked? You know, visa's, passports, car titles, I.D. stuff we had never heard of. We were just going down to Monterey, race a little bit, and be right back, promise! They took our driver's license as I.D. and I had a motor number for the Olds. They also insisted on an I.D. number for the Scorpion, racecar or not, we all got to looking for some numbers on the block. 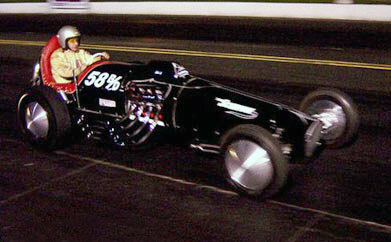 We looked all over, nothing; Bobby spotted a number on the Weiand six carb. two barrel manifold. Here it is he said to the guard, right on top for all to see 18436572. The guard said yippee, wrote it down, finished the paper work and we were off. For Ford people I won't even try to explain the numbers, Mopar and GM people know. Phil Weiand knew what he was doing when he put the numbers there. Thank you Phil for the I.D. number to cross any border in the world. We giggled all the way to Monterey. The highways were asphalt all the way from the border to Monterey. Good but narrow. Not many signs. Lots of sage brush, good for relieving your self behind. NO TREES! In Monterey we checked into a Hotel. This was really new to us as we usually slept in a Motel room, one room with one bed for Bobby and Ruth, while the rest of us slept on the floor We were all excited about having some authentic Mexican food that night. We ordered verbally as we could not read the menu. We took a few bites and discovered that they did not know what spices were, flat as a flitter, bland, but we ate it anyway. 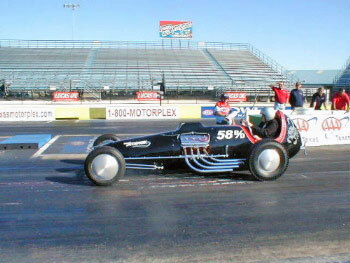 We got up the next morning (Sunday), had breakfast, which was good, and set out for the drag strip. We parked in the basement of the hotel and had to go up a ramp to get out. I put the Olds in first gear and headed up the ramp. We got almost to the top, but the Olds would not pull the scorpion and trailer up the ramp. Every one got out of the car. I backed up into the garage and around a curve, would you believe. I got sort of a running start with the guys pushing and made it to the top. They all piled in again and we headed out. When we got to the strip we saw gas under the Olds. The fuel pump was leaking! No problem, I went to a parts house with a local while the others removed the worn out pump. The new pump was $3.00; those people knew how to gouge a foreigner. 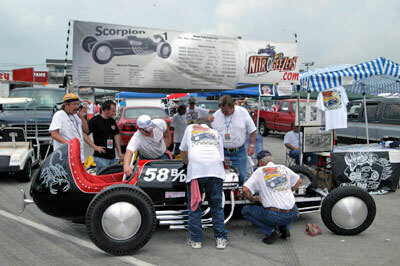 We got the Scorpion ready to run at the "strip". We were at a major traffic circle with a Statue in the middle and were to run down one of the four feeder roads. At our age we still knew more than most folks, right? We could not see the end from the starting line and we didn't go down and look at the end of the "strip". There was a small rise in the road and then a small drop down to the end. We put 98% in, lined up and blasted away. I tried to follow Bobby in the Olds but as soon as Bobby went down the Spectators, who were on both sides of the strip, ran out to see the dragster. We could hear Bobby but could not see him. 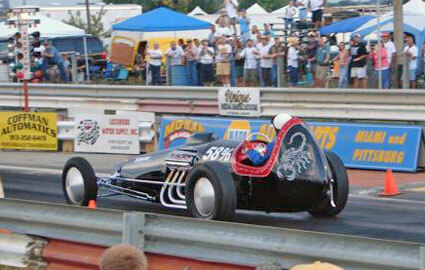 We honked the Spectators out of the way and finally reached Bobby and the dragster. By the time we got there Bobby was out of the car. As we nearly reached the end we found that Bobby had run over a set of railroad tracks. That's not good on frame rails made of 36 Ford drive shaft tubing with an unsprung rear end. I think we bent the frame rail about two inches. But as smart as we were we did not have to even take a look. Off in the distance we heard a lot of shouting. A goat herder was chasing about fifty goats out in the field, all going in different directions. Apparently the noise of the header pipes scared the poop out of them and they took off. He may still be looking for some of them. We made the day winning dragster class and Top Eliminator, and collected some of the most beautiful trophies I have ever seen for a drag race. Bobby still has them in a trophy case built into a wall in his home. They are front and center with hundreds of others. There were no clocks so we did not know how fast we went, but not very fast because of the rough road. We started back to Fort Worth as the sun was setting. At about dark 30, we noticed the gas gage almost setting on E. we were in the middle of nowhere with no stations in sight or a town on the map. Everybody kind of woke up then. We also had no spare gas can. We were still partially smart. With every experience we got wiser. Then in the middle of pitch black of the night in the desert we saw a small light bulb glowing way off in the distance. What was it? As we got closer we saw a shack the size of an outhouse with a gas pump in front. Hallelujah, gas! We got the car filled up, then had to pay the attendant. He could speak no English and we spoke no Spanish. So we just started putting Dollar bills in his hand until he shook his head no. We put some more in his pocket, loaded up and headed to Texas, thanking him and the Lord for the gas. What an experience and so much fun for us. Something to remember for the rest of our life. Today we would not do that without weeks of planning. Then we just jumped in the car and took off. I say Bobby won the 1958 Mexican Nationals. 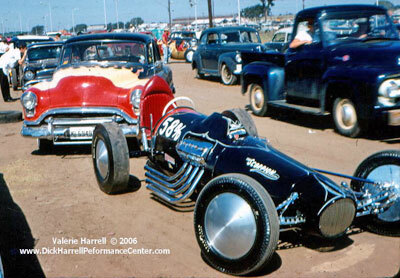 In 1959 Bobby sold Scorpion 1 to Bob Taylor and Charles (Smiley) Sitton. They raced it with a new red paint job and called it The Red Hoss. 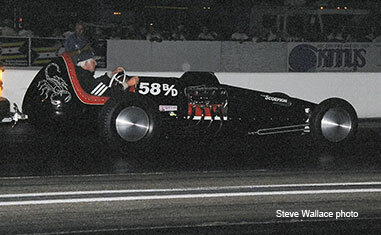 The car had A blown 354 on gas to run B dragster class. 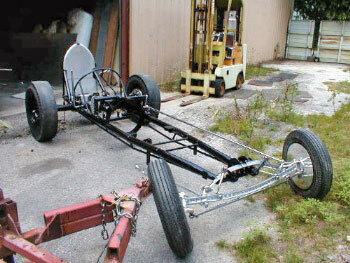 The Chassis was made of drive shaft tubing and through the years had started to bend in front of the engine. 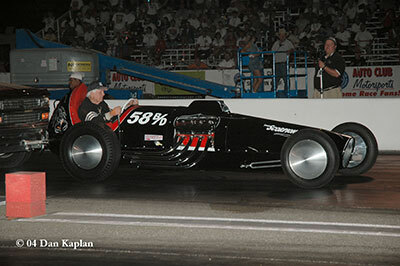 We finale got Bob Taylor to admit that he had scraped out the aluminum body and chassis around 1960. The plan to recreate Scorpion 1 B was hatched on an all night trip to CHRR 2002. Bill Collins, Paul Adams and Don Ross were driving straight through to California. At around 2:00 in the morning some where in Arizona Ross blurted out "Do you know what is missing from the Cackle car group"? That woke every body up and they started talking about the parts we would need. This got them all the way to sunup and the California border. At the reunion they asked Bobby and Ruth (Langley) about the project and he was glad they were going to do it and not him. Bob was a great help in the recreation. 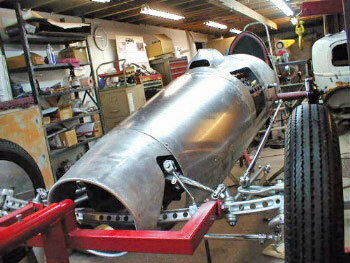 As progress on the car went on he would consult with Ross as to how the car was originally built. 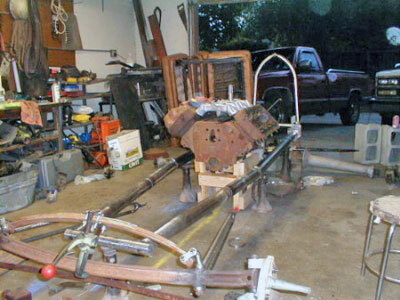 The start of the frame: the front tubes are 1936 Ford inside drive shaft tubing that tapers down to 1-7/8" to mate to 1-1/2" pipe cross member. 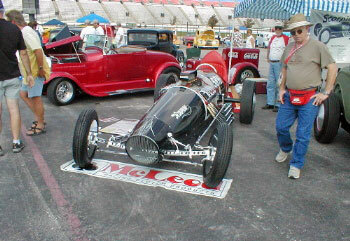 A model "A" axle and 1940 Ford front spindles were used. 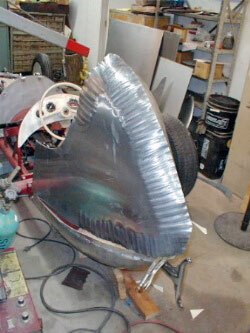 Don Ross began bodywork on the tail section first. Here the right tail skin is shown with edges shrunk on the pull max machine with thumbnail shrinking dies. After much hammering, shrinking then then rolling in English wheel the tail took shape and could be welded together. 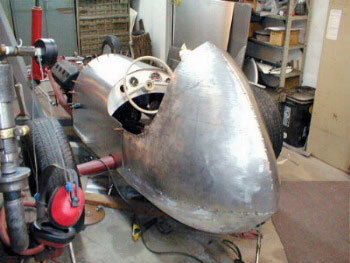 With the tail all but done, the nose was Ross' next project along with the engine cover. 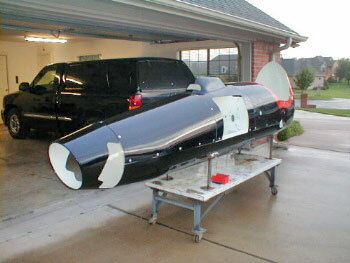 With the body done, the chassis was painted and ready to assemble. 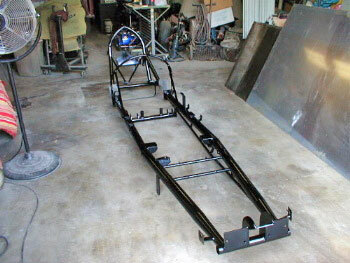 The rolling chassis ready for final assembly. A 1957 392 was built and owned by Tinker's machine Shop of Yantis TX. 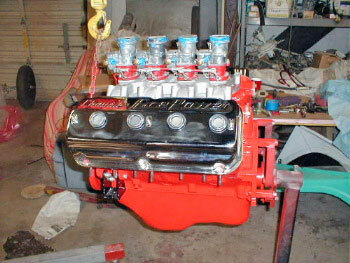 It has an Isky 505 hydraulic cam and four Two barrel carburetors. Craig Hulls of Wylie, Texas did the paint work. The complete body will Dzus to its self then delivered to Daniel Gay the Pin striper to do his thing just like Langley did In 1957. 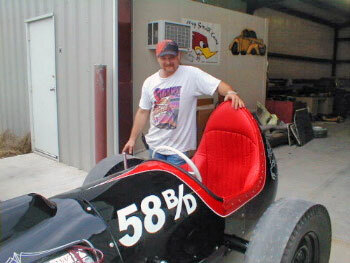 After the striping was done the body was trailered back to Ross' shop for final assembly. Wayne Bayles at Bitchen Stichen upholstered the seat. 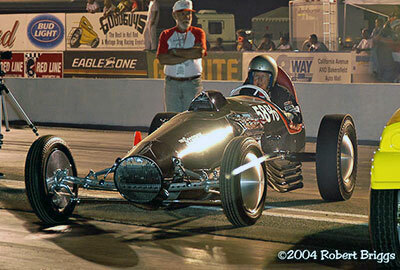 The Seat was the last thing they did and it was finished one day before leaving for Bowling Green NHRR 2004. 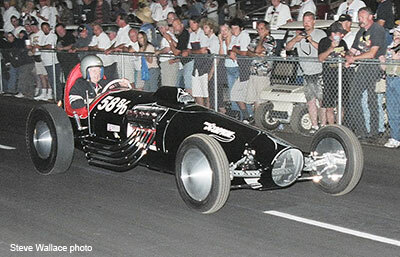 The car made its debut at Bowling Green 2004 National Hot Rod Reunion. 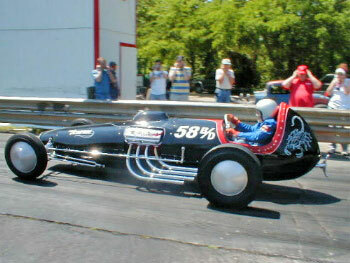 Don Ross in the seat for his and Scorpion 1's first Cacklefest at NHRR 2004. Bill Collins and Don discuss the Push down routine. 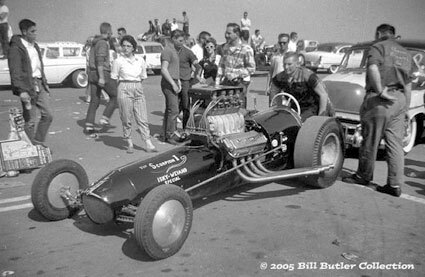 Bill was one of the most helpful people in the early days with Bobby Langley, as Bob did not have his own family car to pull the original Scorpion with. Bobby Langley got his first fire up at his home in Everman, TX. 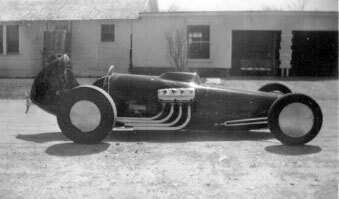 After all of his family got their turn in the seat they took the car to Ed Mabry's shop. Ed didn't know they were coming and was quite surprised when Bobby drove the car right up under his drive way cover and yelled out asking if he could machine some axles like he used to do. Group pose, Don Ross, Sharon Ross, Ruth Langley, Bobby Langley and Bill Collins. The trophies are mostly from the Mexico trip. Only about 1% of what Langley has on display in two showcases in his den. 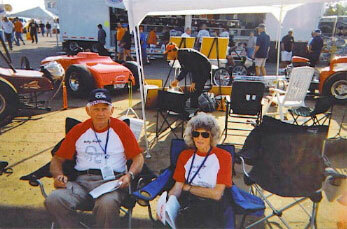 The cars next appearance was on the Left Coast at the 2004 California Hot Rod Reunion Bob and Ruth Langley, who have been married for over 50 years, resting at the teams display tent. Ruth gives Bobby a kiss before he pushes out for Cacklefest IV - his first. Langley and The Scorpion out for the Cacklefest Parade. The Scorpion was the first car down to fire for Cacklefest. Langley parked in his spot. What a thrill it was for him. 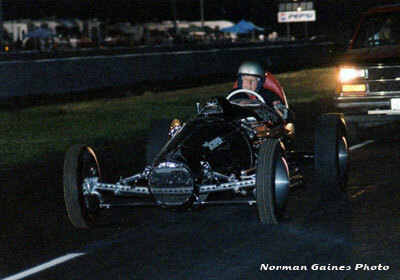 Bill Collins makes a short blast at Temple Academy Raceway in Texas. Langley on their "ill-fated" pass at Ennis, Texas. The old cast iron clutch Ross had put in the car let go as he wound out second gear and clutched to shift to high. The car has a 1940 Ford trans. running second and high gear. Ross also installed reverse as a convenience to move the car around. Bobby was not hurt, just surprised. 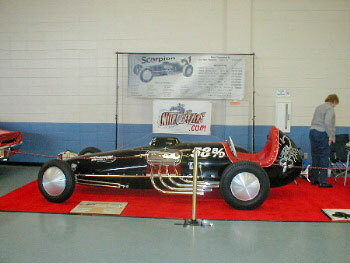 They displayed the car at Texas Motor Speedway for the Goodguy's car show in 2005. This was their first time out after fixing the damage from the clutch explosion. They now have a complete McLeod flywheel and clutch set up that works perfectly. They took Scorpion 1B to the Tyler, TX. car show in Feb. 2006. 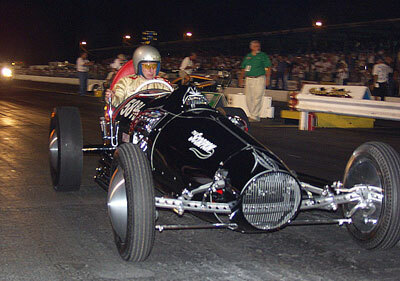 They plan several outings for 2006, one of which is NHRR IV in Bowling Green, KY.